From cream pies, breads, and puddings to whips, freezes, and tarts, there are plenty of delightful banana dessert recipes. Often the first favorite fruit of young children because of the soft texture and mild flavor, bananas can be solitary fruits in a multitude of recipes. They also serve as an accompaniment to other fruits such as berries, melons and oranges. 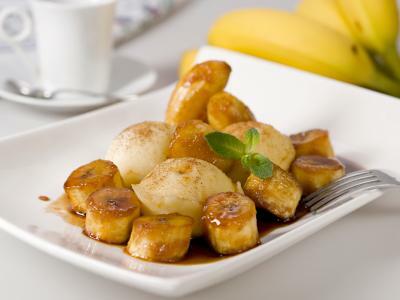 A useful fruit for many delicious desserts, bananas do need some careful handling to guarantee their versatility. Depending on how the fruit is to be used, different ages of fruit may be desirable. The freshest specimens are very firm, perhaps with a tinge of green in the peels' coloring and there will be no brown spots. Bananas continue to ripen after picking, so choosing greener fruit is acceptable if the recipe will not be made for several days. Green fruits are firmer, suitable for recipes requiring slices, though their flavor may not be as sweet. They will bruise easily, however, and should be stored carefully. Consider refrigerating the fruit to slow ripening. If your recipe calls for a very ripe banana, you'll want one that has a darker peel, perhaps with a large percentage of brown spots. These age spots and bruises make the fruit much softer, suitable for any dessert recipe that requires pureed fruits. Because they are so soft already, however, overripe fruits should be used quickly. Riper bananas are generally slightly sweeter than green fruits. When peeling fruit for your banana dessert recipes, be sure to remove all strings from the soft fruit for the smoothest, most consistent flavor. Also, be sure to trim the ends where the peel was attached, since they may have tougher sections. A mild, delicious fruit that is easy to chew and digest, as well as high in potassium and other essential vitamins and nutrients, bananas are a delicious dessert choice. Their versatility makes them applicable in many classic recipes, or experiment with your own banana concoctions to create new family favorites.